For May, our book club discussed Art in Fiction. We could read any fiction book in which art featured prominently. 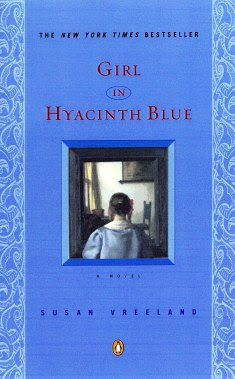 I first read Tracy Chevalier’s Girl with a Pearl Earring, and then I moved on to Peter Mayle’s Chasing Cezanne, but I only hit the jackpot with Susan Vreeland’s Girl in Hyacinth Blue. Girl in a Hyacinth Blue is a fictional Vermeer painting from Vreeland's imagination. This imagination was inspired by real-life Vermeer paintings, a common theme of which is a subject looking out the window, both subject and window bathed in golden Delft sunshine. Daily props and accoutrement litter the scene to paint a story of extraordinary ordinariness. This is a beautiful read. I try not to use the word beautiful too casually, because it is way too easy to use it as a default adjective. But this book really is beautiful. Physically beautiful. Though my copy is just a mass market paperback (MMP), its proportions are slightly narrower and taller than the usual inelegant MMP. 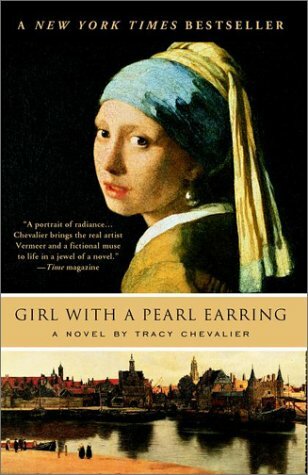 The cover suggests a Vermeer painting, but it does not show it exactly the way the author describes it in the book. This means the burden and gift of imagining the painting is upon the reader. Inside, the margins are generous as if framing the text. Gaillard font is an excellent typography choice. And the stories are beautiful. 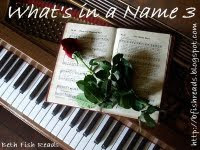 It seems, at first, that the label "novel" is a misnomer, because it is more a series of seemingly unrelated stories in different settings, going backward from Philadelphia present all the way to 17th century Delft. The thread that binds these stories is the painting as it changed ownership, and how each owner perceived it, valued it, or not. I like how the book focused on provenance. Those who know even a little bit about art know that it’s not a commodity, its value not determined just by supply and demand, but by so many factors. Provenance is one of those factors that can give a piece legitimacy and can make its value go sky high beyond logical reasons. Yet, in this book, provenance is not treated as a valuation component. Provenance takes on a deeper meaning as the stories show the worth of a painting to the one who owns it, hides it, holds on to it for dear life, paints it, and even to the one who inspires it. My favorite story is story number 5, Morningshine. The painting comes to a poor farming family, a couple and their 3 children flooded in, stranded in the second floor of their home, with all the possessions they saved. Oh, and a cow. This line struck a powerful chord within me. In relation to the beauty of reading. Sometimes, I feel people scoff at the time and money I spend on fiction. Like it’s a waste of time when there’s more to be learned from books that teach or inform. I like non-fiction. But there’s got to be some beauty too, the kind of beauty that only fiction can give – the kind that stirs the heart enough to make me cry or laugh. I know some people who will spend their lunch money on a book and starve their stomachs but feed their souls. They get it. They get what Vreeland is saying about art and the agonizing balance of worth between the practical and the beautiful. There are other stories too, but I’ve said enough about this one, my favorite one, that I don’t want to spoil the rest for you. So, this finally satisfied my Art in Fiction lust. Peter Mayle was on my list – my list of Favorite Authors I’ve Never Read (FAINR), authors I buy whenever I get the chance. Shelf candy, perhaps, sharing space with other FAIRN authors, Theroux, Pynchon, and Vonnegut. But I knew I wanted to read him because I’m a frustrated travel writer. 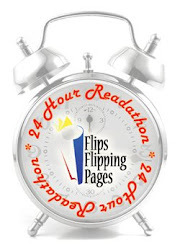 But you know how it is with TBRs – too many books, too little time, and too much Facebook. FFP's May’s themed book discussion on Art in Fiction was the kick I needed to finally read a Mayle. Chasing Cezanne fitted the theme perfectly. This book had all the promise – a scrumptious recipe of travel, food, art, wit, and suspense – the stuff Mayle is known for. The promise was delivered. The book presents a little bit of all. Sadly, it was just that – a little bit or each element. A little bit of travel – main protagonist, New York based photographer Andre takes the dotted line to the Riviera and Cap Ferrat and the Bahamas and Paris, and other European destinations on my TBV, To Be Visited, list. A little bit of art – well, it’s about a Cezanne. Just a teeny, very teeny weeny bit of suspense; more is revealed than kept as mystery. A little bit of all those, but but not enough of any of those to satisfy. I imagined it to be a light comedy flick starring Steve Martin with a fake tan and a funny moustache. Mayle will not move from my FAINR list to to my Favorite Authors list; not just yet. Though I still think he is worth another read as a non-fic, purely travel, food, and wine author. As a novelist, he is just like what my book nerd friends call sorbet, something to cleanse the literary palate. And so, this too was not enough to satisfy my Art in Fiction lust. So I moved on to this. Unsoliticited Preamble: I’m having a fit of rebellion. Against myself. 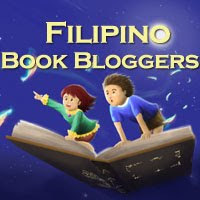 Against my self-imposed responsibilities of reading 70 books this year, reading authors A to Z, and blogging about them. When I was in school, I always rebelled against things I HAD to do – memorizing the multiplication table, memorizing chemistry lists, reading required reading. And it feels that way now; though I love reading, the HAVE to read and blog about it aspect irks me. Even if I’m the one who imposed these silly little requirements upon myself. And that’s my excuse for not blogging for this long. I have been reading; not fast enough to hit my quotas though. For May’s FFP themed book discussion on Art in Fiction, I read 3 books (reviewed here in 3 posts) and scanned another (Phaidon's the Art Book). Yeay, me! I started with Tracy Chevalier’s Girl with a Pearl Earring, a book that sets high expectations because it is a best seller, a popular recommendation in online discussions, a book turned power-casted movie. The back blurb screams, "the bestselling novel hailed by critics from coast to coast." It has a beautiful cover; how can it not with the Vermeer painting featuring prominently? Tracy Chevalier is a competent writer. And the premise is enticing. It gives a fictional story of what that painting, that girl, that earring is all about. It’s something my soul immediately latched on to. Because in museums, I love peering at paintings and wondering about the story behind the artwork. Wondering about the times when that painting was done. Trying to see life through the painter’s eyes. And Chevalier’s work successfully does that. It cast a spell on me, and in my mind’s eye, I saw a camera obscura view of daily life in Delft in the 17th century. A visual extravaganza worthy of Oscar awards in costume design and cinematography. My heart cooperated with the vision, and I suspended judgment and cloaked myself in the magic, imagining Vermeer in that milieu, breathing in the smell of pigments, sucked into the enigma of the girl with a pearl earring. Wrapped up in the book, I could almost see the brushstrokes painting the scenes described in the story. If only I didn’t have to come up for air to do real life tasks, if only I didn’t have to think, maybe the spell wouldn’t have to break. Chevalier does historical fiction well, taking the very little known facts known about Vermeer and his family, producing a convincing story that gives a taste of the times. She gives enough meat to the characters to understand their motivations and for readers to engage with the story. Some parts were truly spellbinding. My favorite parts were the ones about painting itself. Chevalier gives a glimpse of the fascinating tedium (oxymoron intended) of producing art way back when instead of art supply stores, there were apothecaries selling raw materials that needed to be painstakingly ground before they could be used for painting. I loved reading about Vermeer’s frustratingly slow, meticulous process of painting, building up layer upon layer, adding and erasing details, perfecting it until many months later it’s finally done and worthy of all the centuries of praise he never even heard. Those were magical segments. But eventually, the magic wore thin. Chevalier takes too long, drawing out a story that isn’t really that much of a story. The conflict is just not compelling enough. The girl seems to be making too much of not much, really. Teenage angst, perhaps. The sexual tension between painter and subject so tautly built up does not explode into a satisfying denouement, but instead unravels listlessly into a disappointing compromise. And so, this book was not enough to satisfy my Art in Fiction lust. So I moved on to this.